Bloody hell, is it POP Fest week already? Well, you’ve got bands such as the Little Ones and Rooney… so oh yeah, it’s definitely POP fest week alright - this week expect neither music that are no less nor more of what we would inaptly call 'pop'. Including another band to the strings of excellent music makers (and shakers) of the ever-so-fun-loving pop music, I’ve preferably chosen these sextet that hails all the way from Delaware, USA that goes by the name of ‘The Spinto Band’. 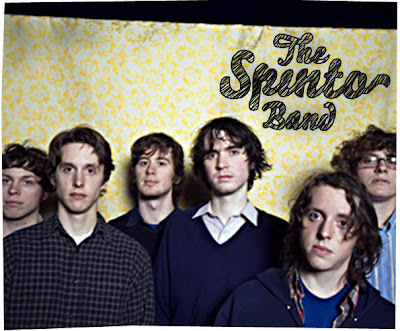 If you’ve heard of the Spinto Band before, then you’ve probably heard of their most coveted track out of their album, Nice and Nicely Done, ‘Oh, Mandy’ and if you’ve heard of ‘Oh, Mandy’ before, you’ve probably heard about band - etc. Unfortunately, that has not been the case for me, for if I had listened to the brilliance that’s sustained by the track ‘Oh, Mandy’ a lot sooner, I would’ve given the LP a spin-to, considering that they are the Spinto band. ‘Directly to the Helmet’ was my first hearing experience by them, and though it’s a fairly good tune on its own, it doesn’t quite catch up to the mark that’s been set by the aforementioned track. It just builds up a different perception towards the band for me; I wish it could’ve happened the other way around. It’s definitely pop music that this band so seamlessly manufactures, but with a little something extra – quirky trims all around due to the usage of the mixed contrasting instruments. The result is pop jingles that are not too over-powering but still satisfying and infectious all the same. ‘Oh, Mandy’ may be Indie pop’s greatest anthem of unrequited love yet, uplifting continuous strums of the mandolin paired with nonchalant falsetto vocals that’ll yank at your heart stings throughout the tune. ‘Directly to the Helmet’ is somewhat the contrast to the earnestness contained in ‘Oh, Mandy’; life’s pretty much in slow motion with this song stuck in your head but it overflows with whimsical lyrics, Your work looks great/Your look works great which makes it a song that doesn’t tire your hearing over repeated listens.